As you know, President Beverly Hogan, after having served Tougaloo College so well for 17 years, will retire from the position of president on June 30, 2019. The Tougaloo College Board of Trustees authorized the establishment of a Tougaloo College Presidential Search Committee at its meeting in May 2018. In consultation with various stakeholders, including Trustee Edmond Hughes whom I appointed as chair of the committee, we have appointed 10 members to the committee: seven Trustees including TCNAA President David Miller, the Faculty Senate President, the SGA President, and a representative of the Mississippi Business Community. 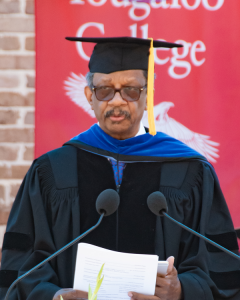 candidates from whom to choose our next Tougaloo College president. The search committee had its first official meeting on September 7, 2018, on the Tougaloo College Campus. The three AGB Search representatives met with and talked to all of the constituents noted above and Tougaloo College Board of Trustee members who are not on the search committee. The search will follow a systematic, professional, and deliberate process. The portal for applicants should be open on October 01, 2018. We expect to have our next president under contract early in 2019, prepared to accept the challenge on July 01, 2019. I, along with Trustee David Miller, will keep you informed regarding the search committee’s status as the process proceeds. Thank you for your unwavering commitment to our cherished Alma Mater, Tougaloo College.